ONE OF THE MOST RESPECTED NAMES IN THE INDUSTRY, DAN POYNTER PUBLISHES a F-R-E-E NEWSLETTER WHICH REACHES OVER 20,00 PEOPLE PER MONTH. I ALWAYS ENJOY DAN’S NEWSLETTERS, BUT IT WAS THE OPENING PAGES OF HIS OCTOBER EDITION THAT NEARLY TOOK MY BREATH AWAY. THANK YOU DAN FOR YOUR GREAT SUPPORT! FOR THOSE WHO STILL HAVEN’T HEARD ABOUT TALES2INSPIRE, A FIRST RATE “AUTHORS HELPING AUTHORS” PROJECT/CONTEST, JUST SCURRY OVER TO THE WEBSITE FOR ALL THE HOW TO’S AND ANSWERS TO YOUR QUESTIONS. STORIES ARE NOW BEING ACCEPTED FOR THE 2013 SEASON. CAN YOU INSPIRE OTHERS WITH THE POWER OF YOUR WORDS.? GREAT P.R. BENEFITS AWAIT ALL WORTHY ENTRANTS. After its most successful first year, Tales2Inspire reopens this September- an Authors Helping Authors project/contest designed to strengthen your writing skills, give you great exposure, help build your platform, inspire others through the power of your words. F*R*E*E to enter, with PR benefits for all. Write up an inspiring story to touch others through the power of your words. If you are a Winner, your story will be published in a book/e-book along with your bio, photo and link to your website or blog. Even those who don’t win get some special perks. 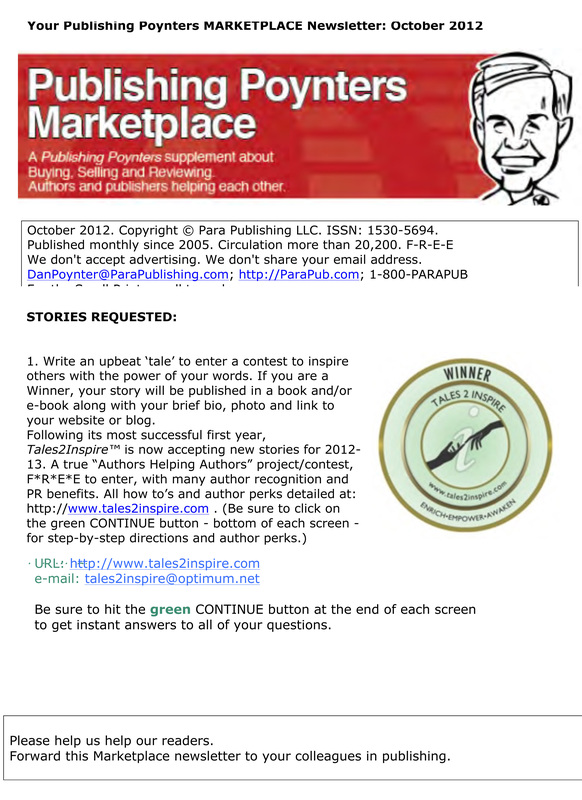 All the details about this Tales2Inspire contest are spelled out here. I’m excited to continue this project, and can’t wait to see the inspiring stories you talented writers submit ths second season. I invite you to catch the spirit, flaunt your talents, and meet the challenge. Wishing you all good luck as you Travel with Lois, Off the Beaten Path. The place to discover stories fusing beauty of the spirit, mind and soul. * I write on many different topics across the Internet. I call them my OFF THE BEATEN PATH articles because they extend beyond the typical concept of beauty. Some explore my thoughts on inner beauty, some tell inspir ational stories of people whose deeds have brought more beauty to the lives of virtual strangers, and some are little more than vignettes of personal experiences that have helped me find peace and harmony in my life. People started to respond with enthusiasm. As interest grew, I began to ponder another thought. Many others must have inspiring tales to tell. What if I invited them to share their stories? I’m excited. I hope you will catch the spirit, join in the fun and meet the challenge! I invite you to visit www.tales2inspire.com to see how easy it will be to Travel with Lois, Off the Beaten Path. Wishing you good luck in both this contest and in life. Beauty Within, Beauty Without . . .What’s Your Passion?